Switch up your tailgate routine with these chicken fajita tacos. No utensils needed. In a mixing bowl, add orange juice, lime juice, pineapple juice, light soy sauce, canola oil, garlic, cumin, chipotle powder, cilantro, salt and pepper. Mix well. Place chicken breasts in a sealable plastic bag and add marinade. Let marinate in the refrigerator for 2 to 3 hours before grilling. In a medium saucepot, place whole tomatoes, whole jalapenos and garlic. Cover with water, bring to a boil, slow to a simmer and cook for 10 minutes. Remove from water, remove core from tomato, stems from jalapenos and garlic, transfer to a blender and pulse until smooth. Season and reserve at room temperature. Remove chicken breasts from marinade, grill chicken on one side for approximately 5 to 6 minutes, turn over and repeat. 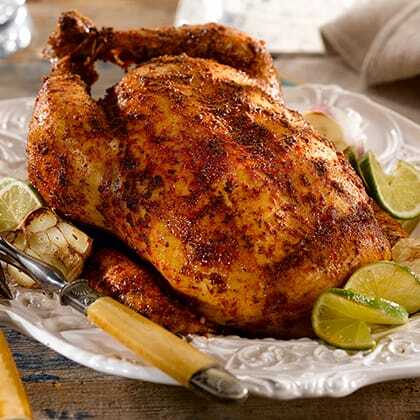 Chicken is cooked when it reaches an internal temperature of 165°F. Transfer to a cutting board and slice into strips. In a Teflon sauté pan, heat corn tortillas on both sides for 1-2 minutes or until soft. Place tortillas on a platter, lay chicken strips on tortillas, add 2 tablespoons of salsa to each taco, garnish with raw onion and cilantro. Squeeze a quarter of a lime on top of each taco.